What is so alluring about skill-based games? Having an endless selection of skill-based games or Slots Games is part of the answer but also the opportunity to pit your skills (through tipping competitions) and your wits against unseen opponents. You won’t have to travel farther than your sitting room to find the nearest poker room. In fact you can even visit Las Vegas - the Entertainment Capital of the World and play in the best Casino Resorts available such as the MGM Grand, Bellagio, Planet Hollywood and many more... And you’ll be saving yourself time and money. Most live poker rooms will only offer one table, if that, but online there is never a problem finding one. You also get the chance to join a decent game by checking the levels of play at each table. You can more than double the number of hands you can play in an hour online compared to live poker. At a live poker table you may get to play up to 30 hands but online this could rise to over 90. Concealing your real identity when playing games can play to your advantage – project yourself as a little old lady for example. Live tournaments take all day to complete but with the advent of online sit and go’s, time is irrelevant. The fee removed from the winning pot is known as the rake and can be twice as great in live poker (over $5 in some cases) but online the max is no more than $3. Dealers at live poker events and other skill-based games can be the pits, with poor shuffling, and general execution of the cards. Online poker of course runs on a slick software program and mistakes are a thing of the past. All in all the online poker and skill-based games experience is far superior to the live version. Other than poker there are a number of games you can play online. Table games such as roulette, baccarat and blackjack, number games such as keno and machine games such as slots and video poker. You should try various casino sites. 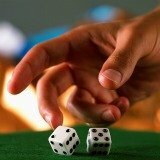 Since all new online casino sites offer different slots and roulette games. You might also consider playing Video Poker. It's similar to table poker, except you play on a machine and not necessarily for money.